Red Sox Manager, Butch Hobson was dealing with lot’s of problems as he attempted to pilot his 1994 Boston team upward in the AL East standings. The hated Yankees had finally gotten their act together under Buck Showalter and were running away from the pack in their division. Boston’s starting corner outfielders, Mike Greenwell and Tom Brunansky were both having horrible years at the plate and DH Andre Dawson was literally and figuratively on his last leg. Jeff Russell, the Boston closer who had saved 33 games the season before was also struggling as his ERA ballooned to over 5 runs for every nine innings pitched. On top of all that, the rumor was that the owners and players were not going to settle on a new contract and the baseball season itself was in jeopardy of being called off because of a work stoppage. 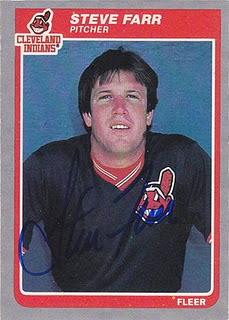 In an effort to shore up the team’s bullpen, the Red Sox made a deal with Cleveland to bring Steve Farr to Beantown. Farr had come up to the big leagues with the Indians in 1984. He was traded to the Royals one year later and Kansas City began grooming the right hander to become a closer. During the next decade, Farr saved 132 games in that role, with most of his success coming as a Yankee, where he was signed as a free agent in 1990, to replace Dave Righetti. In 1992, he had saved 30 games for New York and compiled a microscopic ERA of 1.56 for the season. That magic was gone by the time Boston got a hold of him. The then 37-year-old native of Cheverly, MD appeared in 11 games for the Red Sox during the balance of that abbreviated season, winning his only decision but accumulating no saves. The strike that ended that season also ended Farr’s big league career. He and a shortstop named Pee Wee Wanninger, another former Yankee, were the only two members of the all-time Red Sox roster I could find who were born on December 12th.